lighting, and various unique style elements repurposed from the many theatrical productions which have take place here. 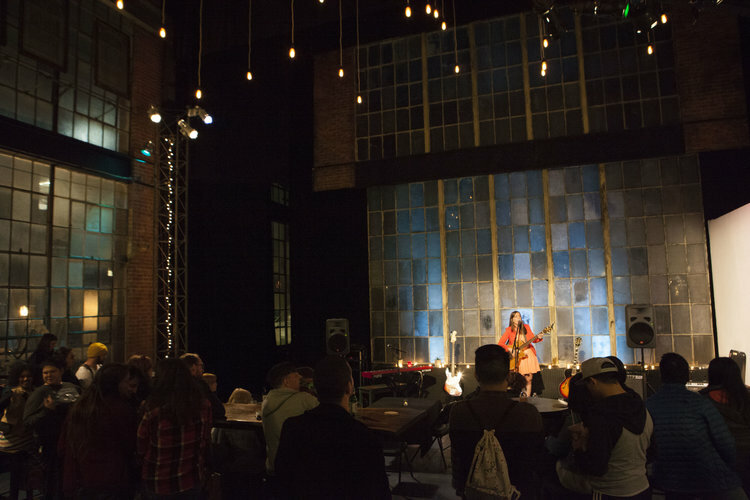 A full service event and performance space in its own right, the 40' x 20' lobby is ideal for hosting receptions, fundraisers, musical performances, book and art premiers, and catered affairs. It has a full bar available for all events, and high top cocktail tables and chairs, plus large 12 foot central table. The lobby/gallery space works very well in conjunction with our large theater (an attached room that seats 244 and has a full sound system, movie screen, and large stage) - click on the profile to see the rest of our listings and inquire with us about events that use multiple spaces. We are easily accessible by BART, MUNI, car, bike, and foot. Once a hub of light industry, the surrounding neighborhood teems with artists studios, galleries, bakeries, chocolate factories and some of SF's hottest restaurants. —Basic modular movement of furniture within the room. —Use of 19' wide by 12' high Gallery wall + small moveable wall for art installations or projections.